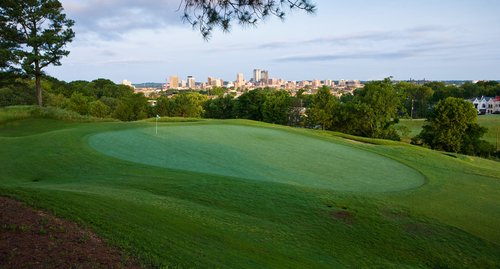 Highland Park, Birmingham: In the heart of downtown Birmingham, Highland Park is the oldest course in Alabama. At just over 5,800 yards, the historic course is still a challenge, with rolling topography, stonewall creek beds, ponds and great city views, providing great beauty and definition to this course. Highland Park is the site of one of Bobby Jones’s first victories at age 14. Cider Ridge, Oxford: Also near Birmingham (and the famous NASCAR track, Talladega), a former apple orchard is now a mountainside golf course with virtually every natural element in play. North River Yaght Club, Tuscaloosa: The 18-hole, par 71 course was originally designed by Gary Player in 1978 and re-designed by Bob Cupp in 1999 and 2015. NorthRiver is a private club and guests must be accompanied by a NorthRiver member or have prior arrangements made with the golf shop while guests at the Jack Warner hotel on site. Gateway Golf Course & Learning Center, Montgomery: The 9-hole golf course features (5) par 4s and (4) par 3s and very fun and challenging layout. Gateway also features a large practice facility equipped with a driving range, chipping and putting area and a private instruction area. Lagoon Park, Montgomery: This beautiful 18-hole public golf course in a city park features a traditional layout with beautifully manicured fairways and Tif Dwarf Bermuda. The facility offers a lighted driving range, chipping and putting area and a private instruction area. Rock Creek, Fairhope: Just off the eastern shore of Mobile Bay, Rock Creek has consistenyly been rated a 4.5 star Golf Digest course. The layout was designed by veteran golf course architect and Alabama native, Earl Stone. The 18-hole semi-private golf course is definitely forgiving and visually spectacular. Craft Farms, Gulf Shores: 36 holes of Arnold Palmer designed golf is found at Gulf Shore’s premier golfing facility. The 18-hole Cotton Creek golf course and 18-hole Cypress Bend golf course challenge golfers at every level while providing a peaceful, serene environment. The courses have a distinctively coastal feel, with dwarf Bermuda grasses and numerous lakes that meander throughout the property. Peninsula Golf & Racquet Club, Gulf Shores: Designed by the renowned southern favorite, Earl Stone, the 27-hole golf course boasts 7,026 yards from the championship tees and delivers a playable and enjoyable layout for golfers of all skill levels. Nestled on the beautiful Fort Morgan peninsula between Mobile Bay and the Gulf of Mexico, the three nine-hole courses wind through over 800 acres of beautiful live oaks, cypress trees and much more natural vegetation.